Creating Dramatic Lighting in a Snap! Home / blog / Creating Dramatic Lighting in a Snap! Hello again, LayerCake and StudioMagic friends! Here again is our own Harry Kerker with the 411 on how to take charge of the lighting in your scene with StudioMagic 2. I’m reminded of how many times I’m driving on a fast moving highway and the sun breaks through the clouds creating a glorious array of light-beams and bursts. Or I’m in an old castle in Europe with light streaming through windows and my camera doesn’t see it, so I try the old nose grease trick where you rub upside your nose and smear it across your lens, but that only makes my lens dirty. The point is, most of these glorious moments we miss because they are unexpected and fleeting and we are just not ready. I’m going to run you through the basics of creating streaming light with StudioMagic 2, it’s pretty easy once you get the hang of it. 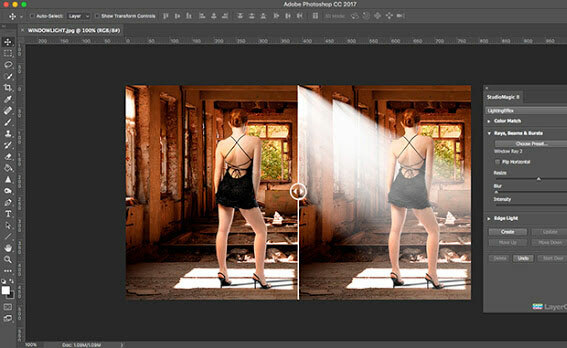 In this before and after example, you can see that there is strong light coming through the window and casting light on the floor. Unfortunately the beam itself is not visible, usually because there’s not enough dust in the air to be picked up by the light streaming in. 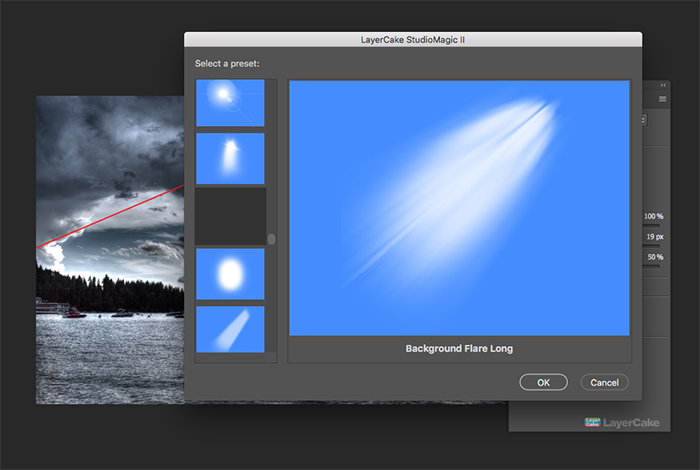 StudioMagic to the rescue, I go to my LightingEffex module and choose “Rays, Beams & Bursts. You’ll have a choice of light to choose from in the thumbnail gallery, so pick one and click OK, the create button will place the selected light ray in your image. Now you may not see a perfect fit for the window in your choices which is ok, you just want to get close enough to the kind of light ray you envisioned as a starting point. Once you place you light ray, you can now shape it to your window. 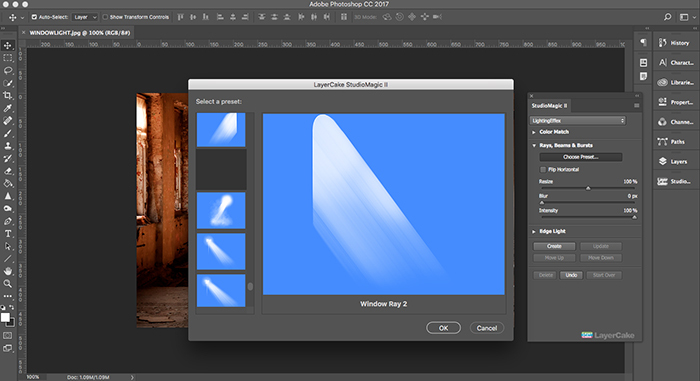 From your layers pallet, select the new light ray layer. Under the “Edit” menu choose “Transform” then “Distort”. You will now be presented with a box around your light ray with a series of square anchor points. 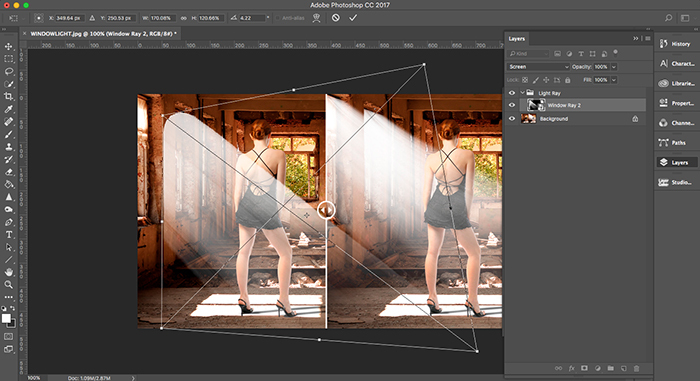 Pull any of the anchor points and you will be able to reshape and angle your light ray to the direction of the light in the example. But what about that rounded top on the light ray, that’ll never fit in a squared off window frame! light ray layer again and right click on it. In the drop down menu that appears, choose the option to “Rasterize Layer”. By rasterizing the layer, you can now cut and trim the layer to fit the window frame. 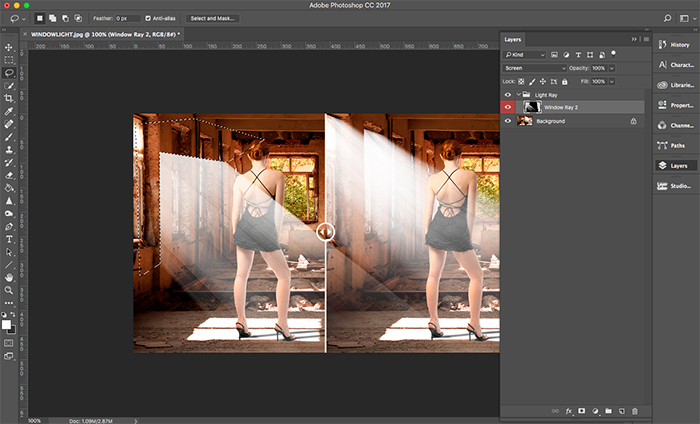 You may have to go back to your distort tool to get just the right fit for the window. You’ll notice that I have light coming through the second window as well, just duplicate the layer and size it down to fit. 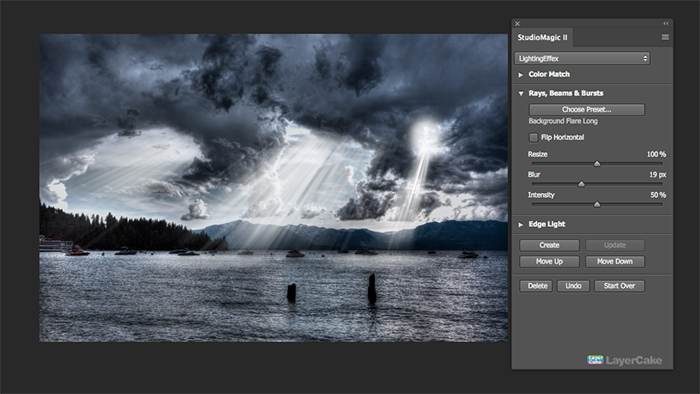 For landscapes adding dramatic lighting is created using the same techniques as with interiors. Of course thick cloud cover with intermittent openings works best for dramatic lighting effects. Once you have decided which openings you plan to beam light through, draw lines to where you think the sun is located. 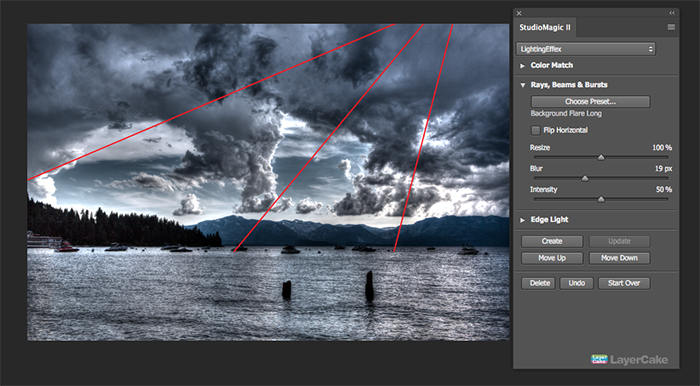 The lines should all go back to the same finishing point, which will determine the angle of your lighting as it shoots through the clouds. Choose the appropriate light beam for the situation; in this case the light would be broken into multiple beams as it filters through the clouds. Once the light beam is placed, you can resize and rotate it to fit your directional lines. In this example I have seven different light beams. Don’t be afraid to experiment. A good little trick is to lay a flat light beam over a broken one to give it a bright glow. Try breaking a light burst through an area where the light passes through the opening. Lets also not forget that light hits the surface of the water as well, so try placing a light burst on the water’s surface and distort it into a long oval at the bottom of your light ray. Harry Kerker, is the president and co-founder of LayerCake inc.